Soft and sweet, Murray is a mischievous little furball. He loves to cuddle (and who could resist those big eyes? ), but be warned – he may just sneak off with your shiniest objects after you fall asleep. He loves sardines and jazz fusion. He’s afraid of bees. And he needs a new home! 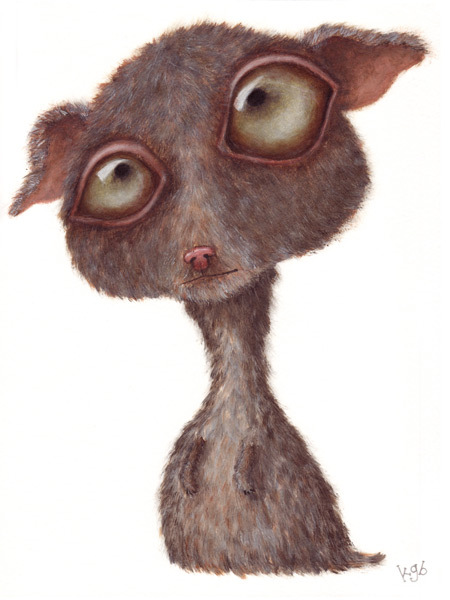 I was planning to put this little critter up for sale at a Recession Friendly price, so I painted him on paper instead of canvas. After spending the better part of 6 hours working on his fur however, I had to bump up the sale sticker. I’m going to shop for frames next week and if I find something that screams MURRAY! I’ll offer him framed and ready to hang. Now I think I’d better get busy painting him a buddy! Next postHappy Birthday Sweet Pea!